Status updates are a big deal in the world of social networking. Everyone has to know what you are doing right when you are doing it. This couple decided to let the world know they were married during the middle of the ceremony. You will love this one. 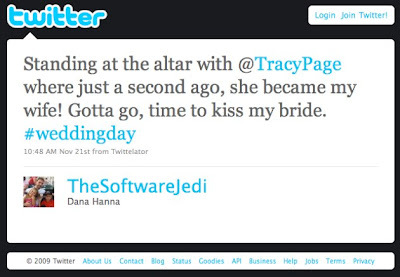 Be sure to check out the video featuring the newly married Dana Hanna and Tracy Page changing their status updates. I love weddings.